When describing yourself and your work, stick to the facts. For example, say you work in a ball bearing facility. You could say, “Our ball bearings survive extreme temperatures…” and reference tests and tangible evidence that you’ve performed to find out just what your product can do. Or, you could say something along the lines of, “We have the best ball bearings in the world.” The first approach is more effective, because the fact has been proven that you have something that works. The second tells your prospective customer nothing useful, because that kind of statement is entirely based off of opinion. Your customer is smarter than they seem, and they will know every time that you’re neglecting concrete facts when you claim to be superior. You’re pushing propaganda that is meaningless to your customer. They may even wonder what you’re hiding. Because there is a difference between how we can believably talk about ourselves, and how others can do so. If an individual or corporation claims that they are a “guru,” “the world’s best,” or something similar, this is a huge indicator that factual evidence is getting swept under the rug, for the sake of a sensationalized and “dramatic” campaign. There aren’t any facts involved, in fact. These types of statements are fillers that many use in an attempt to pad information into their argument, which is entirely useless. If someone else says you’re the best in the world, that’s different. 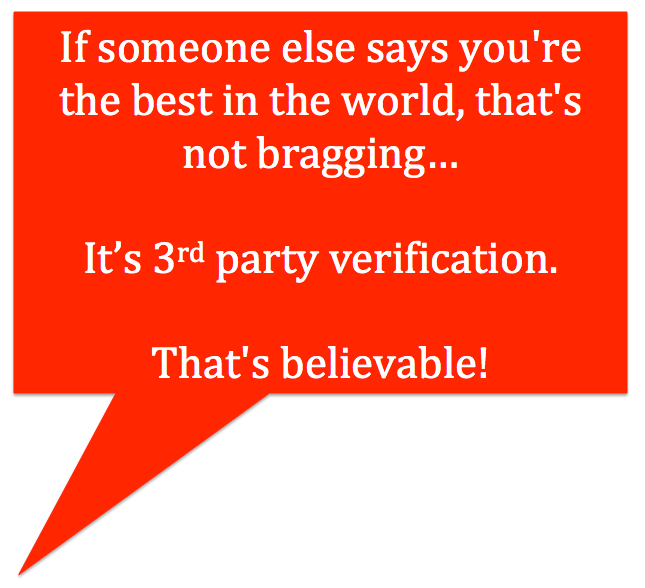 Something about that third party verification is believable, because the opinion serves as a testimonial from an outside source. It’s not the individual bragging about himself. It’s someone else bragging on you. So when talking about yourself and your business, stick to the facts. Share any information you have about how your product and company perform and rely upon social proof to support your assertion that you are indeed the market leader in your industry. This may appear as a recommendation on social networks like Linkedin.com or testimonials delivered via your corporate website. This will allow your potential customer to realize that you’re the best at what you do. Want to be the “go-to” person in your industry?